Why wearing a helmet won't always keep you safe! "25% of accidents are due to collision, either with another person or with a static object such as a tree or safety gates." That's probably not a surprise to many skiers and snowboarders. Large numbers of people, at varying levels of competency, on the same slippery slope at the same time, is bound to involve some risk. So in recent years the wearing of crash helmets has become something of a sensible precaution. Manufacturers have also managed to turn them into fashion statements, with a wider choice of funky designs and colours becoming available each year. "Wearing a helmet reduces incidence of less serious head injuries by between 30 – 50%. And reduces severity of all head injuries in 50% of cases." Yet wouldn't it be better to avoid the collision in the first place? Skiing or snowboarding in control, and always within your limits, can be one of the best ways to make sure you are not the cause of injuries. Remember the FIS rules and make sure your children are aware of them too. The FIS rules, if you don't know what they are, are 10 rules of conduct for the piste and should be followed by skiers and snowboarders alike. The basis of this code of conduct is respecting others and making sure that you are aware that this a potentially dangerous environment. Think of them as a kind of highway code for the mountain. 1. Respect for others - A skier or snowboarder must behave in such a way that he does not endanger or prejudice others. 2. 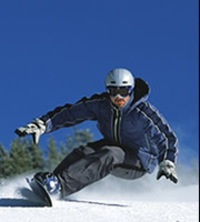 Control of speed and skiing or snowboarding - A skier or snowboarder must move in control. He must adapt his speed and manner of skiing or snowboarding to his personal ability and to the prevailing conditions of terrain, snow and weather as well as to the density of traffic. 3. Choice of route - A skier or snowboarder coming from behind must choose his route in such a way that he does not endanger skiers or snowboarders ahead. 4. Overtaking - A skier or snowboarder may overtake another skier or snowboarder to the right or to the left provided that he leaves enough space for the overtaken skier or snowboarder to make any voluntary or involuntary movement. 5. Entering, starting and moving upwards - A skier or snowboarder entering a marked run, starting again after stopping or moving upwards on the slopes must look up and down the slopes that he can do so without endangering himself or others. 6. Stopping on the piste - Unless absolutely necessary, a skier or snowboarder must avoid stopping on the piste in narrow places or where visibility is restricted. After a fall in such a place, a skier or snowboarder must move clear of the piste as soon as possible. 7. Climbing and descending on foot - A skier or snowboarder either climbing or descending on foot must keep to the side of the piste. 8. Respect for signs and markings - A skier or snowboarder must respect all signs and markings. 9. Assistance - At accidents, every skier or snowboarder is duty bound to assist. 10. Identification - Every skier or snowboarder and witness, whether a responsible party or not, must exchange names and addresses following an accident. Whilst all skiers and snowboarders are aware of the buzz, the adrenaline and the excitement of going at speed downhill, respecting the rules will mean that you can enjoy yourselves without being a menace to others. Being out of control is possibly one of the main causes of accidents so if you can't stay in control get lessons and learn how to adapt to conditions. So whilst wearing a helmet is sensible, and there will always be accidents that can't be helped, making sure that you, and those that ski or board with you, observe the FIS rules, stay in control and generally have consideration for other mountain users, can help to avoid the accident in the first place! The long awaited Flaine Montsoleil residence, the newest jewel of the Intrawest crown, has just opened its doors, with the completion of the first stage called Les Terrasses d'Eos. The development has been conceived along the same lines as their prestigious Arc 1950 complex in Paradiski, and for Flaine it is an exciting addition to the resort. Flaine has one of the best snow records in the world for a non-glacial resort and has long been a popular resort with British families, Whilst the brutal architecture doesn't win too many admirers, the ski area and the convenience of getting into it, has won many fans. Now with the new Intrawest apartments available, visitors have the option of some good quality accommodation, which will be ski in ski out by Winter 08/09, with the completion of a new chairlift to link the development to the ski area. The apartments themselves are a far cry from the shoe box style studios often found in the French purpose built resorts. Large flat screen TV's, wifi, fluffy bathrobes, designer toiletries, and excellent fixtures and fittings are the norm in these apartments. There is also an outdoor swimming pool, heated to 30 degrees, a jacuzzi, sauna and fitness area with large windows overlooking the ski area. To encourage visitors, prices for these new apartments are highly competitive - Christmas 2008 for example starting at less than 300 euros a person, in a 2 bedroom, 2 bathroom apartment with views of the slopes. So if you've never skied in Flaine and the extensive Grand Massif ski area - with 5 linked villages, excellent snow cover for most of the season, and a short transfer from Geneva - this year you can stay in luxury for a fraction of the price, so it might be a good time to try it. 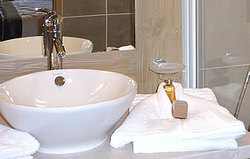 Take a look at our Flaine section on Chalets Direct. The mountains may not be the automatic first choice for keen golfers but the choice of courses plus the spectacular scenery available should certainly put them on your “to do” list. Have a look at your favourite ski resorts’ website to see what the summer activities are and you may surprised that probably not too far away from where you were skiing last winter there will be a golf course or two. A ski resort’s summer programme can vary from adrenaline downhill mountain biking, white water rafting, extensive hiking, to more sedate pleasures such as music festivals, events celebrating local farming traditions, but amongst the activities on offer golf will usually be on the list. For a tourist-based economy, attracting visitors year round is important, so a summer clientele can be as important in many ways as a winter one. Getting golfers on board is a good strategy and many courses will offer good value for money. Mountain golf courses have been designed in the most unlikely of places, on narrow plateaus overlooking the ski area, on ridges, in hollows, in valley areas – anywhere where they can fit 9 or 18 holes. Quite often the local topography will provide natural obstacles and challenges – no need for too many annoying bunkers when you’ve got a cliff face to hit the ball over instead. The ingenuity of designers can be very much in evidence – and often a mountain course will double up as something else for the winter months. The beautiful Chamonix course for example, sitting in the valley overlooked by Mont Blanc and the Aiguille du Midi, is part of the cross country ski area in the winter. And the golf course at Les Gets is part of the Portes du Soleil ski circuit – so you will be skiing over it in the winter! The challenges of maintaining a course when for possibly half the year it may be buried under a few metres of snow require a lot of thought and planning – green keepers will have to think 6 months ahead at least, and will be at the mercy of the elements to a far greater extent than their counterparts elsewhere. And what does an alpine golf course offer? Well part of it is the spectacular scenery. Reaching the green to find a fabulous panorama below your feet that stretches for miles, plus the effort in getting to that green – it quite literally takes your breath away! Yes often there is a tad more physical effort involved! There are some well known courses too – one of the most famous is the Evian Masters on the shores of Lake Geneva, with views across to Geneva and Lausanne. Just within an hour or two of Geneva there are several courses available, varying in difficulty but all will provide stunning views and a unique alpine feel about the place. Chamonix, Megeve, Les Gets,Talloires, Flaine, Evian and at Geneva itself to name just a few. The flowers are the local mountain flowers, gentians, wild pansies, hardy rhododendron bushes, the odd edelweiss or two. I’ve played on the high altitude course at 1900m in Flaine and even found a resident marmotte basking in the sun near the tee on hole number 6. Losing balls on an alpine course will mean that they are often lost forever – plunging into a gully where there is no way they will be recovered! So next time you’re looking for a different golf destination maybe take a look at your favourite ski resort first – there may be a golfing gem just waiting for you to discover it.